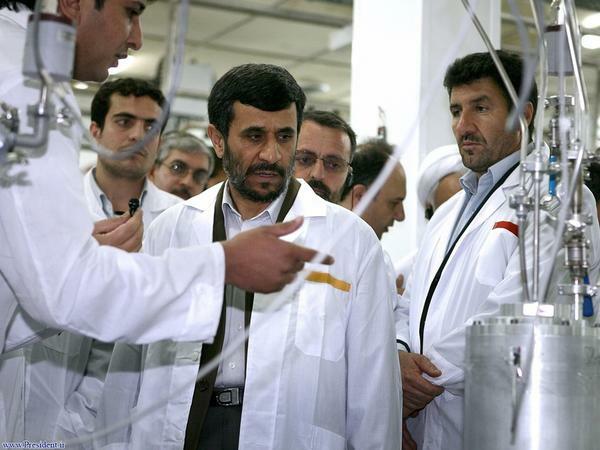 Iranian President Mahmoud Ahmadinejad (center) visits the Natanz Uranium Enrichment Facility in April 2008. Israel and the U.S. targeted the facility in 2009 with the Stuxnet cyberattack. Talk in Israel of a military strike on Iranian nuclear facilities has reached a fever pitch. Last week brought the news of an alleged "war plan" leaked to a blogger. This week, a well-informed military correspondent in Jerusalem reported that Israeli Prime Minister Benjamin Netanyahu is "determined" to attack Iran before the U.S. election. Two weeks ago, an outgoing government minister told Israelis to prepare for a war that would last 30 days. Some analysts dismiss the speculation as an effort to intimidate Iran or put pressure on the U.S. to get tough on Tehran. David Makovsky of the Washington Institute for Near East Policy has his own contacts in the Israeli leadership. He says there's more going on here than just war talk. "I think there's a 50-50 chance before the U.S. election of an Israeli strike," he says. In any case, it's clear there's a lot of war thinking going on in Jerusalem. The alleged war plan that was recently leaked said an Israeli strike would begin with an unprecedented cyberattack designed to paralyze the Iranian regime and blind it to what was happening on its territory. The Internet, telephones, radio and television transmissions, the electrical grid would all be taken out. That's an attention grabber: The world has never seen a cyberattack remotely that dramatic. John Bumgarner, chief technology officer at the U.S. Cyber Consequences Unit, says the plan does make sense, at least in theory. "Israel has very good cybercapabilities. Some of the best computer scientists in the world come out of the Israeli military and intelligence branch," he says. "Some of the best cybertools that are currently used in the world come out of Israel." But could the Israelis actually pull off a nationwide cyberattack in Iran? Bumgarner is skeptical. "Maybe they could carry out the attack against certain nodes in the country, like, you know, Tehran," he says. "But to carry it out across the whole country would be very difficult." Security analyst Jeffrey Carr, the author of Inside Cyber Warfare, says he doubts the Israelis could even take down Iran's power grid, let alone its entire high-tech sector. A grid, Carr points out, is made up of multiple power plants, each with its own network configuration. "An attacker has to map out the network before it can plan an attack. The scenario that's been described on this war plan, or whatever you would call this, is just fantasy," he says. "There's no way that anyone could create a piece of software or weaponized malware that could just wipe out multiple power plants and multiple grids with one strike. It's nonsense." So, some of the war talk in Israel is apparently exaggerated. But this may only reflect the debate going on in the country. Someone could circulate a poorly thought-out scenario to discredit the Netanyahu government's war planning. Makovsky says the volume and variety of speculation about an Israeli strike on Iran just underscore how seriously the idea is taken. Even apparently outlandish plans, he says, should not be discarded out of hand. "You're going to see all sorts of things out there, and some of it might be disinformation or psychological warfare. There's no way we're going to know," he says. "The Israelis do pride themselves on, you know, surprise elements that no one is thinking about." After all, three years ago, Israel and the U.S. joined in the Stuxnet cyberattack against an Iranian nuclear facility in Natanz — a surprise to many. Seemingly far-fetched war talk could amount to propaganda and little else, but it could also mean an Israeli strike on Iran is around the corner. The decision may not yet be made. In Israel, talk of a military strike on Iranian nuclear facilities is reaching fever pitch. News stories feature leaks and theories about what might happen and when, including a scenario that starts with a massive cyberattack on Iranian computer networks. NPR's Tom Gjelten now considers whether that's a realistic possibility. TOM GJELTEN, BYLINE: Last week brought the news of an alleged war plan leaked to a blogger. This week, a well-informed military correspondent in Jerusalem reported that Israeli Prime Minister Benjamin Netanyahu is determined to attack Iran before the U.S. election. Some analysts think it's all just an effort to intimidate Iran or pressure the U.S. to get tough on Tehran. DAVID MAKOVSKY: And I think there's a 50/50 chance before the U.S. election of an Israeli strike. GJELTEN: In any case, it's clear there's a lot of war thinking going on in Jerusalem. The alleged war plan that was recently leaked said an Israeli strike would begin with an unprecedented cyberattack to paralyze the Iranian regime. The Internet, telephones, radio and television transmissions, the electrical grid - they'd all go down. That's an attention grabber. The world has never seen a cyberattack remotely that dramatic. John Bumgarner, chief technology officer at the U.S. Cyber Consequences Unit, says the plan makes sense, in theory. JOHN BUMGARNER: Israel has very good cyber capabilities. Some of the best computer scientists in the world come out of the Israeli military and the intelligence branch. Some of the best cyber security tools that are currently used in the world come out of Israel. GJELTEN: But could the Israelis actually pull off a nationwide cyberattack in Iran? Bumgarner is skeptical. BUMGARNER: Maybe they could carry out the attack against certain nodes in the country like, you know, Tehran, but to carry it out across the whole country would be very difficult. GJELTEN: Security analyst Jeffrey Carr, the author of "Inside Cyber Warfare," doubts the Israelis could even knock out Iran's power grid, let alone its entire high tech sector. A grid, Carr points out, is made up of multiple power plants, each with its own network configuration. JEFFREY CARR: An attacker has to map out the network before it can plan an attack. The scenario that's been described on this war plan or whatever you would call this is just fantasy. There's no way that anyone could create a piece of software or weaponized malware that can just wipe out multiple power plants and multiple grids with one strike. It's nonsense. GJELTEN: So some of the war talk in Israel may be exaggerated, but this could only reflect the debate going on in the country. Maybe someone is circulating a poorly thought out scenario to discredit the Netanyahu government's war planning. David Makovsky of the Washington Institute says all this speculation about an Israeli strike on Iran shows how seriously the idea is taken. Even apparently outlandish plans, he says, should not be discarded out of hand. MAKOVSKY: You're going to see all sorts of things out there and some of them might be misinformation or psychological warfare, and there's no way we're going to know. Israelis do pride themselves on, you know, surprise elements that no one's thinking about. GJELTEN: After all, three years ago, Israel and the U.S. joined in the Stuxnet cyberattack against an Iranian nuclear facility. For many, that was a surprise. Seemingly farfetched war talk could amount to propaganda and little else, but it could also mean an Israeli strike on Iran is just around the corner. David Makovsky gives it 50/50 odds. It may just be that the decision is not yet made. Tom Gjelten, NPR News, Washington. Transcript provided by NPR, Copyright NPR.